This article analyses the usability requirements of digital pocket cameras for "high performance" snapping (later abbreviated hi-perf snapping). It is a form of photography that combines the ease of use of pocket cameras with a level of excellence of high quality expert photography. This article approaches the issue from the viewpoint of hi-perf snapping, because usability is really about how well a task is executed. Tools should be in a non-central role in all usability analyses, allowing abstraction of their design elements, features and functions. Lets first take a look at what the task and process of hi-perf snapping is like. The process: The process is a circular process. The photographer is always ready for shooting when a photo formulates in his/her eyes. The photographs are anticipated while walking down the streets watching scenes develop, people move, lights and shadows come and go... When the opportunity comes, the camera is taken out, a photo is snapped very rapidly and the camera returned to the pocket (or left in the hand). Most determining success factors: Being ready and fast in every circumstance. Focusing on the rapidly developing situations. Capturing the moment in the personal time-walking-space. What separates the hi-perf snapping from normal snapping are proactive attitude, the effectiveness of the process and the quality of the results. A hi-performance snapper is first and foremost always ready. Images are always met suddenly, and the photographer must be always ready to immediately spring into action. The camera must always be ready for use. It must need no setting up to be usable; ability to remember settings from last use is very important. Many models revert to factory settings, except for image quality settings (resolution, compression). The requirement for fast action means that often the situation is not optimal for best exposures. One may need to hold the camera with one hand, for example, and the camera must be able to shoot good exposures even then. This means high, adjustable ISO rating and a fast lens. The photographer needs to be able to shoot many shots in short succession. In an unexpected situation, one can never know what is the best shot, or whether a shot really succeeds or not. Therefore the camera must have short delays between shots. The Achilles' heel of many cameras is flash recharge time, which can be many seconds. Problems caused by ergonomic "traps"
The remaining battery life should be clearly indicated. Unfortunately, most cameras only provide a simple "low battery" warning, which in some cases comes after just a few shots - even though only 10 % of the battery charge has been consumed. This kind of warning light is totally useless. Snapping is an all-weather activity. Therefore, the camera needs to be rain proof. In most countries another weather related problem is cold weather. Most cameras are guaranteed to work only at plus zero temperatures. That is simply not good enough especially in northern countries. Actually, many cameras can tolerate low temperatures (but with the owner taking the risk of breakage), the only problem area being batteries. NiMH batteries simply do not deliver their charge well in the cold - and some cameras simply don't work with any other commonly available battery type. Controls that can be operated without seeing the button labels etc. Two years ago, I bought Olympus C-21 (shown right in its well used state). All magazine tests wrote about how good it is: small size (smallest on the market at that time), fast operation, low energy consumption and good image quality. 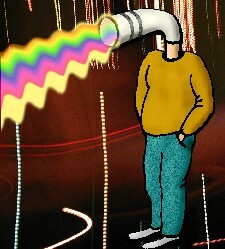 As often, the reality turned out to be just a little different. Was this camera targeted for hi-perf snapping? When it was introduced, it had quite high specification, but the lack of a zoom reveals that this was not aimed for the very serious shooter. But the small size made this camera one of the very few pocket cameras that really would fit in a pocket practically no matter what you might be wearing. I'll present just a few main points of interest, using the previous headings as an outline. Also, changing all settings is done in the screen menu, making for example switching the flash off too slow an operation. Due to its small size and very simple design, this camera looks almost like a disposable camera, not turning attention. When held in hand while walking, nobody notices and cares that you have a camera. This camera has a selection of the worst problem inducing features of any model I have ever used. The lens cover is exceptionally badly designed. It needs to be moved just a few millimeters, to turn the power off, and the cover slides very easily with almost no resistance. Therefore, the camera turns itself too easily off when held normally in one's palm. (I managed to improve matters just a bit with some drops of glue under the lens cover. See the photo, on the right bottom corner. They keep the cover better in place, pulled down into the power on-position). The body seems to be very fragile. The first time I dropped the camera, a part of the battery compartment locking system broke. All small devices should take a dropping from waist level to a floor. This camera is best suited to low quality snapping. It has adjustable ISO setting up to 400, but the photos shot using this sensitivity setting are too noisy for any serious publication. It also doesn't have manual exposure controls. 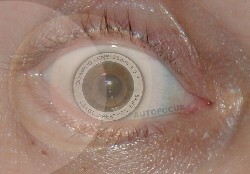 It does not provide for screw-on lenses, making the non-zoomable standard lens the only choice. As it has been noted already a couple of times, this camera doesn't work very well in the dark. It is not weather resistant and according to the manufacturer, works only in plus zero temperature. In any case, the battery power restrictions make its cold weather use cumbersome. Like too many pocket cameras, this on shows serious lack of attention to the user needs. The camera can perform well, but only in ideal conditions when the sun shines and the situation is such that the factory settings work okay. 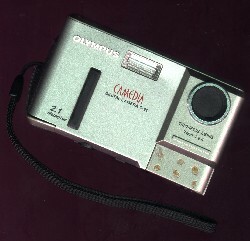 It has been claimed (at around 1999) that Olympus' designers do not listen to users. This may have changed, but this camera clearly shows a designer-, not user oriented attitude. What could have been one of the greatest snappers of all time turns in actual use to be just mediocre.